Week 163 — Go Free Range. Our week has been dominated by the release of INSIDE GOVERNMENT which I’ve already written about. 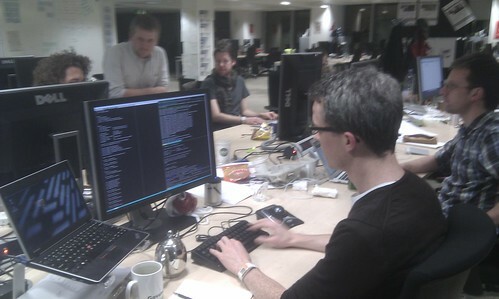 To give you a flavour of what went on, here’s some of the team working at Aviation House around the time of the release with our GDS colleague Paul in the foreground about to press the imaginary big red button. Pizza, beer, and a splash of cava were supplied on the evening of the release. Tom ate most of the pizza. In the days after the release, we continued to work on the project at Aviation House, fixing bugs and responding to feedback from users. James A revealed his secret development technique and made Chris green with envy by running build processes remotely at high speed on his iMac at GFR HQ. However, all good things must come to an end and this was our our last week working on the Whitehall project. That being said we will be popping in next week to take part in a retrospective. Since for some reason I was awake quite early the day after the release of the Whitehall app, I decided to see if I could order a Raspberry Pi. I had the same frustrations as many people with both of the websites which were struggling with the heavy demand, but after persevering for about 30 minutes, I managed to order one. Initially the delivery date was given as 26th March, but this has now slipped to 23rd April. In the meantime, in his ongoing quest to print graphics on a small printer, James A has managed to coax his Arduino into printing the Go Free Range logo, although apparently he’s running short of flash memory. On Wednesday night we all got together at Saf in Shoreditch to say farewell to Jase. Jase has decided to cut loose from the world of software development in order to have more time to devote to meditation & yoga and to further explore various creative avenues. Jase has been a brilliant colleague at Go Free Range and we’re going to miss him. Today he’s heading off to deepest darkest Devon for a month long meditation retreat. We all wish him well and look forward to catching up with him on his return. He did talk about writing a valedictory blog post for us, so it might not be the last you hear from him on here. Later in the evening, the London-based rangers met up with our BERG friends at their drinks for Wolfe+585 and I assume a good time was had by all.